The first time I saw a recipe for grilled pizza I was skeptical. I thought the pizza might stick to the grill or that it just wouldn’t be that much better than making pizza in the oven on my stone. I was wrong! It happens occasionally ;). I will definitely be making lots of grilled pizza from now on. The crust gets really crispy and the grill gives it a nice charred flavor. And since it’s still pretty hot outside, you can have homemade pizza without heating up the oven. I topped mine with some store-bought sun-dried tomato pesto and lots of veggies – it was delicious! I’m pretty much in love with sun-dried tomato pesto now =). But you can use whatever toppings you like – the guys thought it would have been better with some meat. Enjoy! 1. For the dough: Dissolve yeast in warm water. In bowl of stand mixer with dough hook, combine yeast mixture, sugar, and oil. Add flour and salt. Mix on low speed until mixture forms a ball. Continue to mix 3-5 minutes more until dough is smooth and elastic. Adding additional water or flour (~1 tbsp at a time) if needed. Place dough in a greased bowl and cover with plastic wrap. Let rise until doubled, about 1 to 1-1/2 hours (depending on the temperature). Punch dough down and let rest 10 minutes. 2. 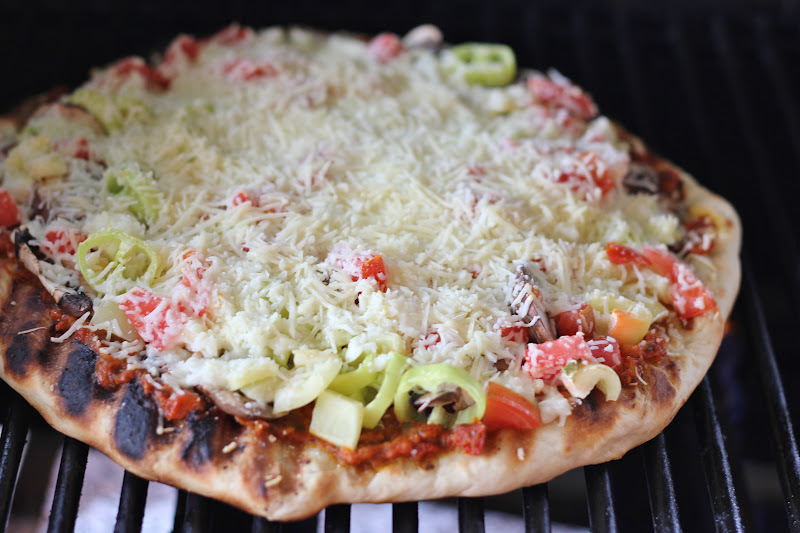 To prepare your pizza, heat up your grill (either gas or charcoal is fine) and oil the grates. Also, spray the BACK of a cookie sheet well with non-stick cooking spray. Set aside. 3. Roll out your dough on a lightly floured surface to roughly about 12 inch diameter. It doesn’t have to be perfect! Carefully transfer the pizza dough to the back of the greased cookie sheet and carry outside to the grill. 4. Gently, lift the dough off the back of the cookie sheet and onto the grill. Close the grill and cook for about 5 minutes, checking occasionally. The dough should be starting to bubble up and if you check the bottom, it should be looking a little charred. 5. Slide the dough off the grill and back onto the back of the cookie sheet. Flip pizza so the charred side is on top. Then add the toppings of your choice. 6. Carefully slide dough back onto the grill, close top and cook for another 5-6 minutes, checking often. When done, the crust should be puffy, the bottom slightly charred and the cheese melted. 7. Slide your finished pizza back onto your cookie sheet slice up! Note: You can use a ball of store-bought pizza dough if you prefer.